Crown Princess Mary of Denmark is currently in Saudi Arabia with a Danish trade delegation for the purpose of strengthening the commercial cooperation between Denmark and Saudi Arabia. On the 2nd day of Saudi Arabia visit, the Crown Princess attended the official opening of "Denmark-Saudi Arabia Business Forum". (More photos related to the opening is here: Crown Princess Mary visit Saudi Arabia - 2nd Day ). 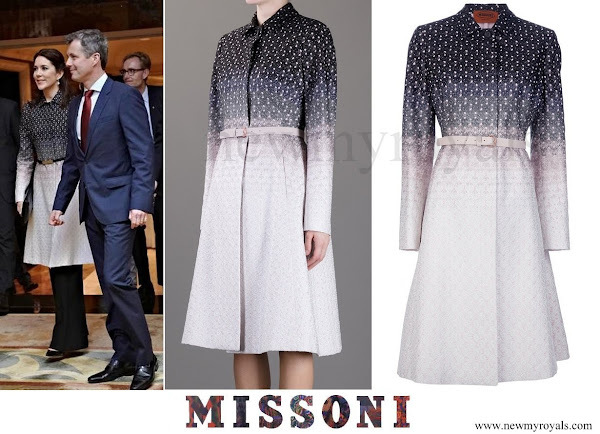 The Crown Princess wore a MISSONI multicolor belted coat at the opening of the business forum. The sales of same models of that coat has ended. A MISSIONI baby pink coat similiar to that coat retails for £797.50 with 50% discount on the " The Outnet " website. The original price of the product is £1,595.00. mary is an asset to DRF, unlike the duchess of doom!!! Very appropriate dress for the country that she/they are visiting, even down to the fabric!